Being in a leadership position does not make you a leader. 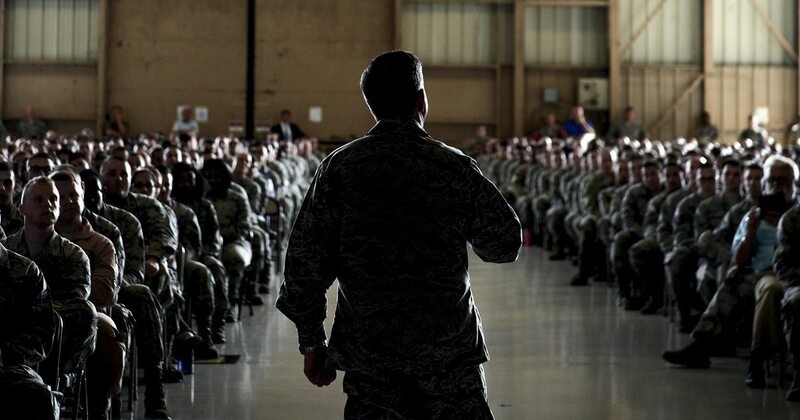 Unfortunately, the Air Force officer system sees it differently. We talk a good game, but the system — to include education, command screening and evaluation of commanders — is seriously lacking. Why? I think the real reason is that leadership just doesn’t matter in the officer system. There’s no accountability and no consequences. Some people still make fun of the total force. Say what you will, the Guard has it right in at least one regard: Its leaders must sleep in the bed they’ve made. There are few “quick win, slash-n-burn, airman-crushing” leaders in the Guard because they are forced to think longer-term about the care and sustainment of their airmen and units. When command climate surveys come in, leadership teams pore over them to assess what they can do better. You want evidence that it works? Look at the retention rates in the active Guard. We are finding smart officers, but we must do more to find good leaders and sideline the bad, the author writes. I’m not suggesting the active duty needs to stay in command longer or move less often. I do think if Secretary Heather Wilson and Gen. Dave Goldfein believe leadership matters, they need to make it matter in the officer system in a tangible way. They need to bake more leadership screening and development into the professional development approach. Professional military education for colonels is lacking in leadership. One block of instruction. There’s some good stuff in there, but, seriously, one block out of an entire year? There’s the opportunity to do a leadership profile with 360-degree input, but it’s optional. Most students don’t take advantage of the opportunity, which speaks volumes. Maybe the Air War College produces officers better informed on national security matters, but it is not producing better leaders. Fellowship programs are even worse. Fellows don’t get a single assigned reading on leadership, let alone discuss it. Once again let’s look at the evidence: How many fired commanders were “distinguished graduates” or fellows in prestigious programs? Nearly all. Don’t believe me? Please, fact check my assertion. This is not to say all distinguished graduates are bad leaders. What I’m saying is the Air Force draws from the distinguished graduate pool for its commanders, but there’s nothing about being a distinguished graduate that makes an individual a good leader. Several recent studies suggest the most effective leaders possess certain attributes and skills. One example is emotional intelligence. I would suggest that emotional intelligence is necessary to build the trust and relationships necessary to solve our airmen’s problems. Yet, the Air Force does not screen for this or any other positive behavioral attribute. Air Force Special Operations screens its personnel to make sure they have the right psychological make up to be effective. Why doesn’t the Air Force writ large care enough about its airmen to do the same for its O-6 and above leaders? Why is the leadership profile at Air War College optional? There are no satisfying answers to be found there. The new Chief Master Sergeant of the Air Force, Kaleth Wright, on Thursday challenged the service’s leaders to step up their game and fix the morale problems affecting the force. I believe the Air Force draws from the “clever” ranks pretty well, but makes the mistake of conflating intelligence and leadership ability. Leave the clever and diligent on the staff where they belong. Do more to find the real leaders amongst the clever and put them in command. Good commanders will work hard to mentor, develop and hold subordinate supervisors accountable. Better flight leadership results in better frontline supervisors. Airmen feel valued and cared for, so they perform better and decide to remain in uniform. What do you think? Is the author right? What should the Air Force do to improve its leadership? Send your thoughts to airlet@airforcetimes.com. Please include your name and rank. With your permission, your comments may be used as a letter to the editor.